All initial certification programs and category one CE programs must be coordinated by a certified Education Coordinator (EC). This page contains information on the process and a link to the online Education Coordinator Candidate (ECC) application. Once the application is completed and approved by the Office of EMS, the provider can initiate the ECC program. A date and location for the next Education Coordinator Institute has not yet been determined and is dependent on having enough eligible EC Candidates in the pipeline to meet the minimum number required to conduct an institute. 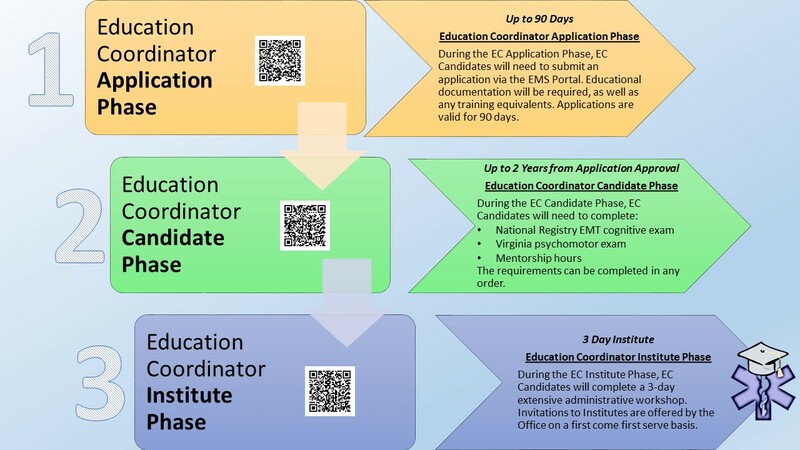 In order to be invited to attend an Education Coordinator Institute, EC Candidates must have ALL requirements (cognitive exam, psychomotor exam, and mentorship) completed and documented in the Candidate’s EMS Portal by the deadline. EC Candidates currently in the process are encouraged to continue to make attempts at the cognitive and psychomotor exams while working through their mentorship. More information on upcoming institutes will be made available as candidates complete the process and the time comes closer. Below is a graphic to help explain the process. If you have any questions, please contact Chad Blosser, Training and Development Coordinator, by email or by calling (804) 888-9124.